Up early, we were out of the hotel room and into the rental car just after 7 am. The plan for the day was to drive to Hana. The road to Hana is without question the most famous drive in all of Hawaii. It is a slow winding road through a lush paradise. The guidebook suggested that we be through Kahului by 8 am. 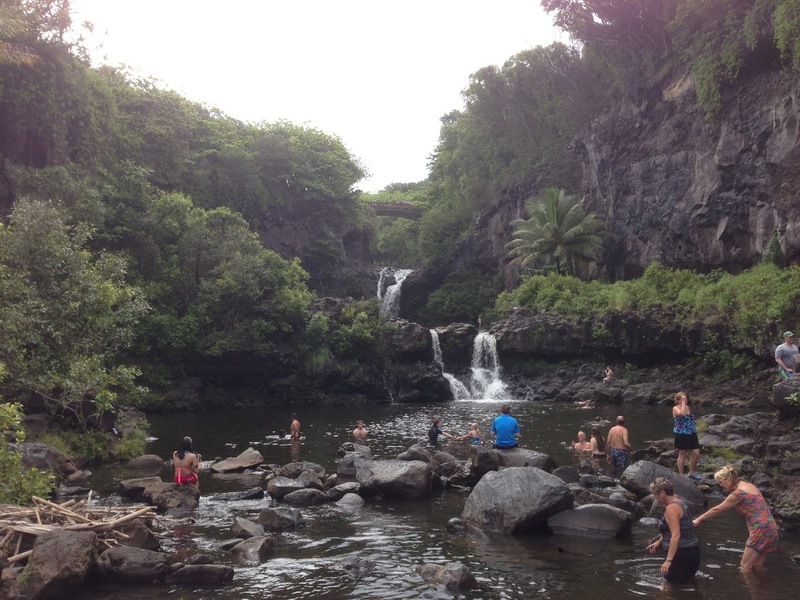 Over the next four hours, we made a number of stops to explore waterfalls, pools and views. We made a decision to rent a convertible for Maui. It was a great way to experience the road to Hana. We drove down to the ocean on Nahiku Road through the community of Nahiku. We bought some banana bread at a roadside stand. We stopped at Wai'anapanapa Park and explored the black sand beach. 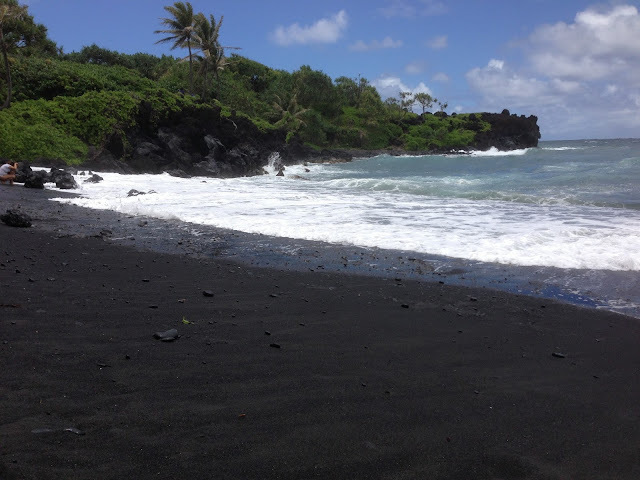 We hiked about a mile along the beach and through the lava fields. We stopped in Hana and had a nice lunch at Travaasa Hana (burger and fish tacos). 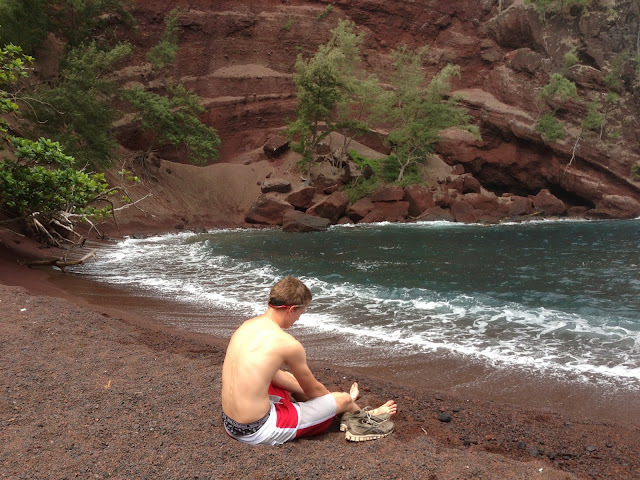 After lunch, Jack and I explored a red sand beach hidden in a gully below the town. While lots of people head back the way they came, we had made a decision that we would continue all the way around the island. We stopped at a very nice waterfall along the road and then made a longer stop at the Seven Sacred Pools. We took a quick dip in one of the larger pools. We hiked about a mile round trip to a view of one of the falls farther upstream. Back in the car, we continued around the island. The road turns pretty rough at this point. It is not paved for about 8 miles. Although it was much drier terrain than the first half of the drive, there were some interesting vistas. Eventually, we got back to a paved two lane road. From there, we had another 1 1/2 hour drive to get back to the hotel. This part was less interesting and I was ready to be done. By the time we got back to the hotel, it was almost 7:30 pm. We had been gone for more than 12 1/2 hours. We finished the night with a late dinner near the hotel at the Maui Fish and Pasta Restaurant. I had mahi mahi, Jack had a Kobe burger and Sharon had a light dinner.